God placed mission work on my heart from an early age – even as a child I had this strange feeling of unity with orphaned, ill and oppressed children around the world whom I’d never even met. I spent the majority of my life with this burning desire to be a missionary. I didn’t know how, I didn’t know when, I didn’t even know if – but I wished and prayed that one day I would be able to reach the people who needed to be reached the most. “When he said ‘anti-malaria medicine’, did he mean actual malaria? You get the picture…I was nervous. And maybe I’m a worry wart – big deal. But, then I started thinking about all the amazing things that could happen from a trip like this. I started to think of all the kids that I would get to play with and love. Kids I’ve dreamed of helping my entire life. I thought about the effect that I could have on these people – the effect that these people could have on me. I knew that this experience would be different and it may be a little bit scary, but I knew that it would also be life-changing in the most incredible way. So I prayed about it and I asked God to give me a sign – anything to let me know that it was His will for me to go on this trip. Well, God didn’t send me a rainbow or a dove with an olive branch, but He washed over me a sense of peace that I know came only from Him. So with that peace, I finished my application (except for the part asking for my blood type which I still shamefully don’t know) and sent in my deposit. Haiti welcomed me with a brick wall of suffocating heat. Growing up in south Louisiana, you’d think that this wouldn’t faze me. But, this was a different kind of heat because I knew that this heat would not soon be relieved by the sweet angel kisses of air conditioning. If I’m being honest, I experienced a brief moment of complete panic. It wasn’t the fact that I wouldn’t have air conditioning or modern amenities for a week. It was the fact that this was the moment that reality set in that I was actually in a third-world country. In fact, I was in the Big Kahuna of the third world countries. I stood in this foreign land hundreds of miles away from my home, my family, modern medicine and the only way of life I’ve ever known. This was a scary moment for me, but I had dreamed of mission work since I was young and I had faith that God intended for me to be on this trip. We’ve all heard of Haiti at some point – the poverty, the orphans, the earthquake. Even so, I wasn’t sure what to expect. Well, I’m here to report that in no way, shape or form could I have ever been prepared for what I saw. The devastation in Haiti is inconceivable. 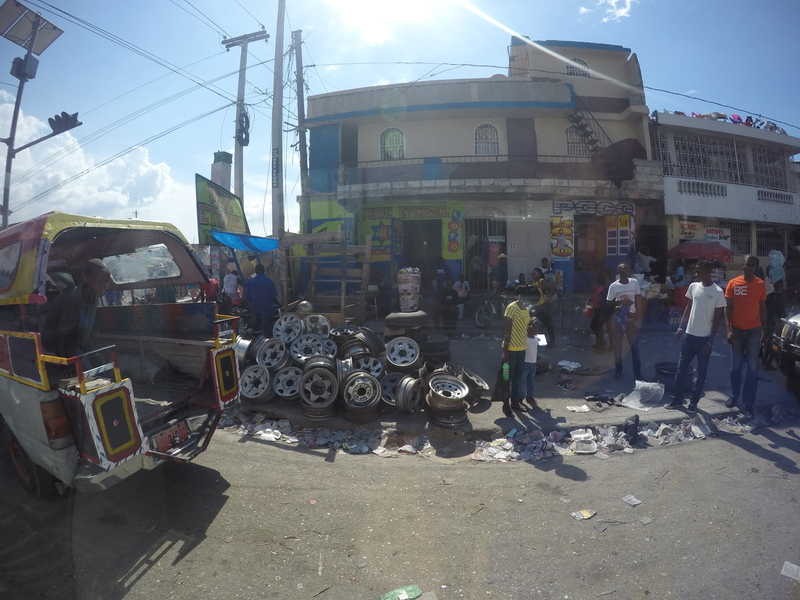 I can’t remember if I even spoke a single word during our drive through Port-Au-Prince. Both sides of the road are surrounded by the “marketplace.” You can imagine it like this – someone threw a bunch of food, old clothes and goats in a dumpster, put the dumpster on a Tilt-O-Whirl, flipped it upside down a couple of hundred times and then dumped it out on the side of the road. That’s what the marketplace looked (and smelled) like. People flock the streets of this city that’s in shambles. Women sit at stands selling food and clothing while men line the sides of the road begging you to buy a bag of water from them (which you can’t drink unless you’re looking to leave the country with a little more than souvenirs). All of these things were devastating to me, but it wasn’t until a young boy selling water caught my eye that reality hit me – and it hit me hard. This child was no more than 13 years old, standing outside my window of our bus begging us to buy water from him. His eyes were the deepest brown I had ever seen and his young skin already aged by the sun. He had the kind of eyes that are a window into the soul. As I locked eyes with him, it felt as though someone was actually piercing my heart and my eyes instantly filled with tears. Without saying a word, his eyes told me everything. In an instant, I saw the pain and the struggle he endures just to survive. When I was 13 I was worried about playing with my friends, bugging my little brother and getting home from school in time to watch Trading Spaces. And here this little boy is begging – in sweltering heat – on the side of the road in the hopes that some foreigner will buy his bag of water for a dollar. This was the most serious reality check I have ever experienced. I recently read a quote that said, “Sometimes you need a reminder that your own life isn’t that tough.” This was my reminder, and I read it loud and clear. Much to my liking, we ended up with a small posse of Haitian children who followed us around everywhere we went – affectionately known as “dem boyz.” They would wait outside the gate of our hotel for us every single morning until we came outside to greet them. Knowing that those sweet faces were out there waiting to smile at us was all I needed to get a little pep in my step each morning. So every morning, we would wake up, go eat breakfast and then be on our way for our day’s mission. This might not strike you as difficult at first thought, but eating this big, beautiful breakfast every morning while I knew these children were sitting 50 yards away with nothing to eat was heart-wrenching. So I did what any good Southern girl would do – I started to pocket extra bananas and bread rolls when the hotel staff wasn’t looking to bring to them once we made it outside. I had this recurring desire to make the people of La Vallee happy which seems simple enough, but was actually quite complicated. Give them what they need to be happy, right? The question is, though, what do they really need to be happy? In America, we see it as simple as supply and demand. They need shoes? Give them shoes. They need a bed? Build them a bed. The thing is, it’s not a supply and demand problem. It took me a few days of being in Haiti to realize that these people already are happy. We spent our days with children who were wearing shoes that were two sizes too small, people whose roofs had gaping holes in them and one little boy who literally slept on a pile of his t-shirts because his family couldn’t afford a mattress for him. They don’t have TV, they don’t have Wi-Fi, they don’t have running water or electricity – they have nothing. But, where they have nothing, they have everything because they have each other. You can’t walk by someone in La Vallee who doesn’t have a smile on their face. They spend their days working in the fields, sitting on the side of the road selling food from their stands and doing whatever else it is they do to provide for their families. And they do it all with a big, beautiful smiles. One of the most incredible things I witnessed while I was there was the way the kids looked out for each other. We have this joke among the Mission Renewers that we like to call “give me.” It was one of the only English phrases that most of the kids knew and it would usually end up on repeat when we would break out the bags of candy. It’s funny to laugh about, but kids will be kids no matter where you are in the world. Even with “give me,” when you gave these kids something, they wouldn’t au tomatically want to hoard it and keep it for themselves. When we were passing out candy/snacks/protein bars, I would watch them closely and when they would get something they would immediately turn to their siblings and friends and make sure to give them a piece too. They were constantly watching out for each other, sharing and caring for one another to make sure that the other survives. I started to see the true beauty of these remarkable people and to realize that they might have a thing or two to teach me. With each passing day and each experience, I fell more in love with the people of Haiti. One day we were walking home from planting trees when I glanced up the hill and saw a lady carrying a baby swaddled in a blue cloth. Being the baby-lover that I am, I couldn’t help but to walk up to her and ask to see her sweet little bundle of joy. She eagerly unwrapped the pile of cloth to reveal a beautiful, perfect 8 day old baby boy. My heart was in the midst of exploding from pure joy when she said something that stopped me dead in my tracks. “Please, you will take my baby?” Her words will echo in my heart forever. The fact that this new mother felt compelled to give her baby to a complete stranger just because she knew I was American and could give her baby a better life absolutely broke my heart. This was one of the most profound moments that I experienced while I was in Haiti and one that I will remember for the rest of my life. It made me even more aware of just how destitute things really are for thes e people. I handed her baby back to her with tears in my eyes, knowing the struggles that they are both sure to face in the future and wishing that I actually could take him for her. It was hard for me to leave Haiti – the night before we left I cried for at least 3 hours. I had fallen in love with these kids that followed us around like puppies all week and the thought of telling them goodbye was heart-wrenching. I’m a nurturer by nature, so my instinct was to stay and care for all of my new friends. I almost felt as though I needed to protect them. While our plane was taking off, I was looking over the mountains that were blanketed by black storm clouds and wondering whether or not my friends had shelter from the storm. I was so worried about them that it made me feel sick, but all I could do was pray. So I quietly asked God to please protect them, wherever they were. I kid you not, I picked my head up from praying and looked out the window to see the most beautiful, full rainbow stretching from mountain to mountain. Smiling, I relaxed because God finally gave me my rainbow and I knew I didn’t have to worry anymore. He was letting me know that I can trust Him – He loves the people of Haiti even more than I do. I left for Haiti expecting to change some people’s lives, but when I got to Haiti what I realized is that they changed mine. My first mission trip completely exceeded my expectations. I would say that it fulfilled my dream, but I now know that my dream has only just begun. I left a piece of my heart in Haiti that day – a piece of my heart that I will never get back. My life will go on while I’m away, but I look forward to the day that my heart will be whole again when I return to Haiti – the place that I love. And join us for our Gala fundraiser on April 7th including a silent auction, great food, and a keynote talk. I just read this from a friend’s Facebook share and I want to say thank you for sharing this. When I was in high school, I traveled to Thailand and also Guatemala. It was the most heart wrenching times I had as a young woman-new place, new language, new life experiences(many that I could have never experienced in America). Those experiences are what made me want to become a teacher. As I end my 4th year of teaching, this was a great refresher for me. Something to remind myself of the call to serve others. Keep up the wonderful work! God Bless!